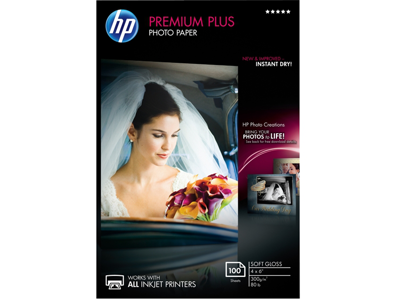 Get the most out of your photos with HP Premium Plus photo paper. It resists water and smudging, leaving you with professional-looking photographs that are made to last. Soft-gloss white photo paper for a professional look. Smudge-free, water-resistant, instant-dry paper for crisp contrast and amazing quality. Special coating on the back of each sheet helps keep your photos from sticking together. Take advantage of the latest technology—this paper works with all inkjet printers and is optimized for HP printers. Rely on photo paper made from certified mixed fiber. HP Premium Plus Photo Paper is endorsed by the Forest Stewardship Council (FSC), which verifies the paper comes from an environmentally and socially responsible source. 1 When using Original HP inks. Display-permanence rating by Wilhelm Imaging Research, Inc., or HP Image Permanence Lab. For details, visit http://www.hp.com/go/printpermanence.